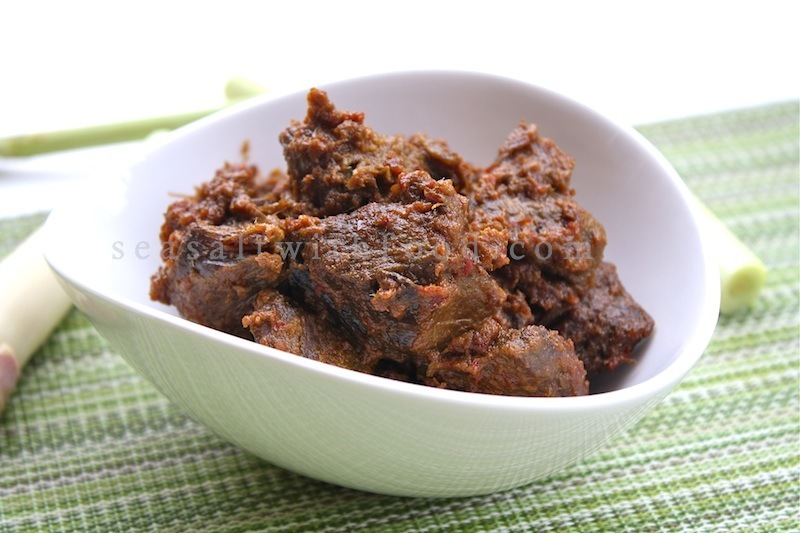 Rendang is a traditional dish of the Minangkabau ethnic group from West Sumatra, Indonesia. It’s also a popular dish in the neighboring countries, such as, Malaysia and Singapore. It used to be served during special ceremonial occasions to honor guests; but, these days it’s available in the menu of many restaurants and is enjoyed regularly by all. Rendang is usually eaten with glutinous rice cooked in coconut milk or just with some steamed rice. 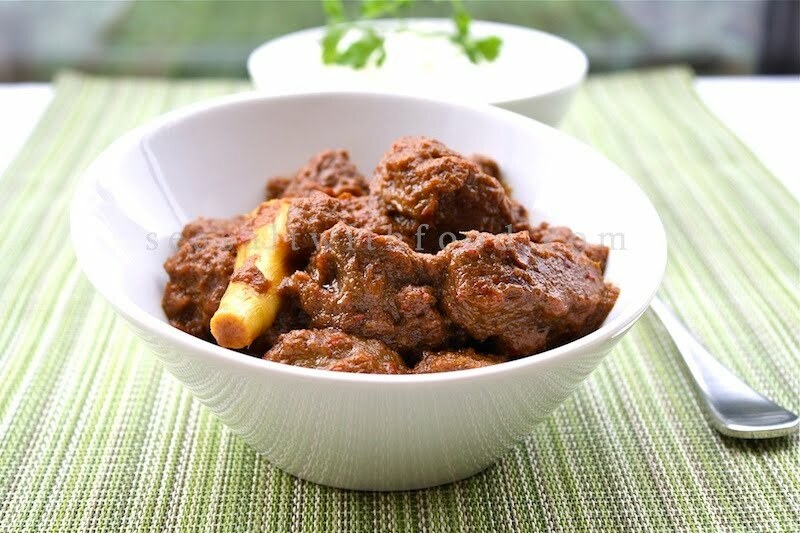 Beef Rendang is slowly cooked in spiced coconut milk for several hours until almost all the sauce is absorbed into the beef, giving it the fusion of delicious flavors from all the spices like galangal, garlic, chilies, turmeric lemongrass, and ginger. Besides the delicious dark brown spiced beef, the slow cooking process will also naturally tenderize the meat as well. Put the shallots, garlic, ginger, turmeric root, chilies and galangal in a blender with 4 Tbsp of the coconut milk, and puree until smooth. Put this paste and the coconut milk in a large wok or saucepan. Add the meat and the rest of the ingredients to the pan; making sure that there is enough coconut milk to cover. Stir the contents of the pan, and start cooking, uncovered, over a medium heat. Let the pan bubble gently for 1 ½ - 2 hours, stirring from time to time. The coconut milk will by then be quite thick and, of course much reduced. If you started in a large saucepan, transfer everything to a wok and continue cooking in the same way for another 30 minutes, stirring occasionally. By now the coconut milk is beginning to reduce to oil, and the meat, which has so far been boiling, will soon be frying. From now on, the rendang needs to be stirred frequently. Taste, and add salt if necessary. When the coconut oil becomes thick and brown, stir continuously for about 15 minutes until the oil has been more or less completely absorbed by the meat. Take out and discard the salam or bay leaf, turmeric leaf or lemongrass. Serve warm with lots of rice. OMG how I love this beef rendang! Never thought of making it on my own...unti now thanks! The beef rendang looks so delicious! Looks fabulous! Looks very delicious....yum. I wish I can have some now. Just rendang with rice is more than enough to make me happy. of all the blogs i've visited, i have not seen anyone do any indonesian recipes! i actually have some close family-friends who are indonesian, so it's great to learn more about their food. thanks for the recipe! Delicious looking rendang, one of my favourite spicy food. yum! This looks hearty... I had my Beef Rendang experience in Penang before.. Does it have any differences with Indonesian Rendang? You are amazing--and not just because you post great recipes. You see, when you post recipes for dishes I've made before, that I haven't quite been able to get to come out right, I usually can figure out what I've been doing wrong/what ingredient or step I've been skipping--thanks to your recipe. It makes me happy! I will try your version very shortly, I can guarantee it. Thank you for posting! yum yum yum--I love Indonesian food. My mom used to make this all the time when I was a kid, it's a delicious dish. Your photos are making my mouth water. I love rendang but seldom make it at home. Now I'm motivated! salam leaves and galangal - have you been able to find these in vancouver as well? t&t? my sister and i made your onde-onde today (without the pandan though) and they turned out great - thanks! 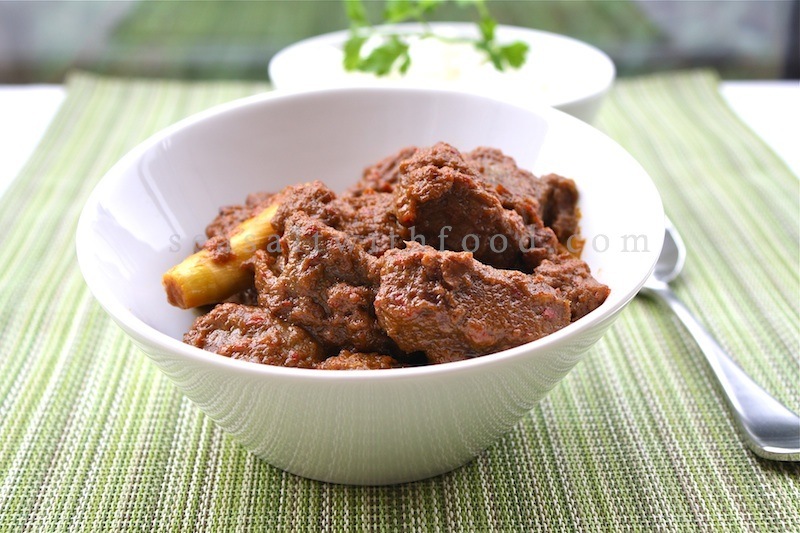 Indonesian beef rendang recipe is vary from region to region. In West Sumatra, people who live in the lowlands have a rendang recipe with more spices compare to people who live in the highlands (mountains). In Java, people add palm/coconut sugar. Joey - you CAN get salam leaves at Asia Market at Gore and E. Hastings. It's a bit tough to see them amidst all the other dried herbs, but they're there.